These snowman and Christmas tree suckers are a perfect stocking stuffer. 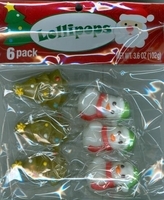 These sucker is in the shape of a snowman and individually wrapped making the great to place in your Christmas stockings or to hand out for classroom parties. We also have santa shaped suckers if your prefer them. Each package of suckers has 6 Christmas pops.